Another fire at derelict TriCare site at Salvin Creek. Saturday 20th January 2018. 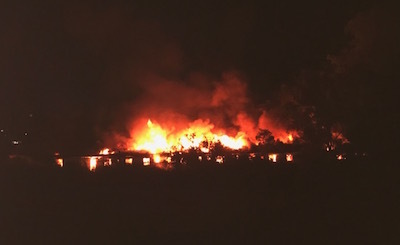 There was another fire at the dilapidated TriCare buildings at Creek Road, Carina Heights on the evening of Saturday 20th January. B4C Catchment Manager Wayne Cameron returned to his Carina Heights home on Saturday evening to find the fire raging close by. He, and others, witnessed several frequent explosions. This is the third arson attack on this unsecured and dangerous site in the last 12 months. This one required 10 fire crews. “There was a spill of fire retardant into the creek from the previous fire in November last year, which was flushed down the creek,” Wayne said. Inadequate fencing at TriCare site. January 2018. 1. There has been nothing preventing TriCare from applying for and enacting a demolition permit. This permit is not in any way tied to a development application or approval process. There is a perception that TriCare is being held up in some way, which is not true. 2. The exclusion fence is breached in several places and there is no security on the site. Anyone can walk straight in. 3. The creek bed and banks near Creek Rd have been sprayed and left in a highly degraded and erodible condition. This has left the creek in a vulnerable and a fauna-unfriendly condition. There is no sediment fencing and the vegetation is dead. A good corporate citizen should consider the local community and ensure there is an investigation of the arson. TriCare has subverted this process by not lodging a complaint with Police. The site should not continue to be putting such pressure on our emergency services and rate-payers. B4C on behalf of the local community and environment, has requested the following from the local government. To investigate the spraying of the creek zone. TriCare should immediately rehabilitate this area, near Creek Road. Their vegetation management plan should stipulate rehabilitation to take place immediately after weed treatments. It cannot be left to degrade at a key junction of the waterway. 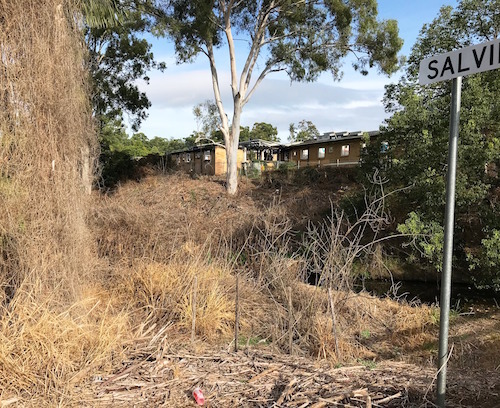 Council and the State Government to take immediate action to protect the creek zone and local community by seeking the immediate demolition of the buildings and adequate compliance for security of the site. QLD Health should immediately investigate reports of possible asbestos exposure. Carina Heights, fire, Salvin Creek, TriCare. Workplace Health & Safety Dept not only has responsibility for on site conditions, but for those of the surrounding areas as a result of conditions/work on the work site. Because of the fires and exploding asbestos, neighbours can contact the State department and insist in an investigation as the asbestos goes up into the air with the flames, heat & smoke, and falls on to surrounding areas. Have you contacted the Environmental Protection Agency as well, Wayne? 2. Investigation of the potential contamination of the site from asbestos burning. This has been stifled by TriCare refusing to lodge a complaint with the Police. Therefore they don’t have to investigate the arson or the aftermath? 3. On-going impacts from poor land-use and degradation of Salvin Creek. 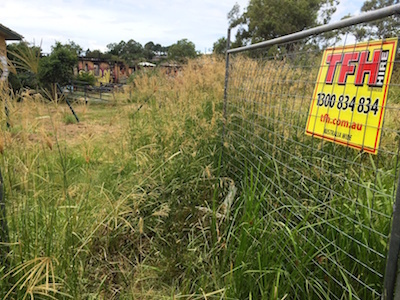 At present herbicide spray near Creek Rd and the denuded creek banks are making a joke of Brisbane City Council’s Waterways Management obligations. A PROPOSAL: Friends of Salvin Creek to become more than a Habitat Group. To care for our long-suffering, but beautiful area and seek to improve our environment and lifestyles. This is what we will move to do now, because people DO CARE!